Beekeepers in the South West are being urged to prepare for more sightings of the latest threat to honeybees and pollinators – the highly destructive Asian hornet. Experts have been briefing the South West Beekeepers’ Forum (SWBKF), which represents around 10,000 beekeepers. Dr Pete Kennedy, a research fellow at the University of Exeter, warned that in 10 years Asian hornets could be widespread throughout the South West and Wales if left unchecked; in 20 years most of England would be affected. He presented the latest findings from a government-funded project which attached specially-designed tags to hornets in Jersey and France to test tracking systems. These techniques are used to track hornets back to their nests so professional teams can quickly dispose of them. 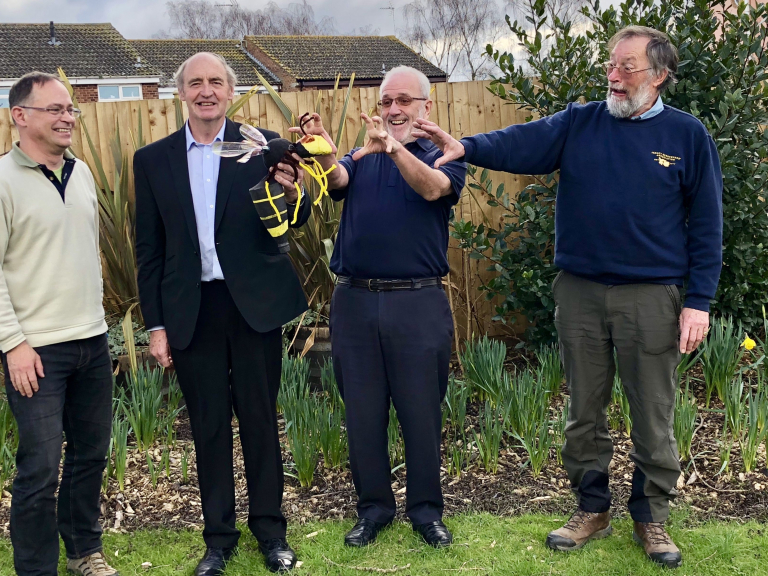 He urged beekeepers, wildlife groups and the public to all play their part in detecting the insect and reporting it to the Great Britain Non-Native Species Secretariat. He called on lorry drivers and cross Channel ferry passengers to carefully check their vehicles in the summer in case they were unwittingly returning to the UK with an Asian hornet. Jersey beekeeper Bob Hogge described how the invasive insect arrived on the island two years ago and had spread rapidly. Beekeepers were working with the Channel Islands’ government to hunt down and eradicate nests and were developing new tracking techniques. The most recent sighting in the UK was in Woolacombe, Devon, by beekeeper Martyn Hocking, who described the shock of making “a most unexpected and unwelcome discovery”. “As a result of what happened in my apiary, I would like to see beekeeper action teams set up to investigate possible sightings and support individual beekeepers,” he said. South West Regional Bee Inspector, Simon Jones, said rapid reporting could make all the difference between eradication and widespread establishment and encouraged all beekeepers to know how to spot the insect. Asian hornets are slightly smaller than native hornets, have a distinctive black/dark brown thorax; brown abdominal segments with the fourth segment almost entirely yellow-orange, brown legs with yellow ends, a black head and an orange-yellow face. Beekeeping associations in the South West are drawing up ‘battle plans’ ahead of the coming season. Photo cap: Asian hornet experts briefed the South West Beekeepers’ Forum and posed outside the venue with an outsize model of the invasive insect. Pictured are, from left to right, Dr Pete Kennedy, a research fellow at the University of Exeter; North Devon beekeeper Martyn Hocking, who discovered Asian hornets in his apiary last year; South West Beekeepers’ Forum Chairman Peter Darley; beekeeper Bob Hogge from Jersey where Asian hornets established within a year.